Tip-off is at 5:30 pm sharp! FREE ADMISSION WITH SCHOOL ID! 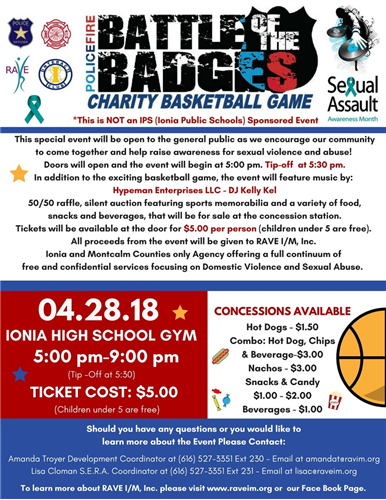 All the proceeds raised during this fun filled the event will benefit RAVE I/M, Inc. - Ionia and Montcalm Counties ONLY 24 Hour Emergency Shelter and Outreach Center offering a full continuum of free and confidential services focusing on Domestic and Sexual Violence victims and their families.